This article submitted by Linda Stelling on 12/1/98. Crafts aren’t just a holiday event or project for Mavis Twit, 68, Rice Lake. Crafts are something she does all year-round. However, at Christmas time she is kept busier as she is making gifts for her 19 grandchildren and seven great-grandchildren. When the Twit extended family is all together, there are 41 people home for the holidays. Using leftover material from other projects, Twit has decorated tea towels for the holidays. She has also made potholders, napkins, pillows, porcelain dolls, silk scarves and quilts. Twit also takes old earrings and turns them into pins for the residents at the nursing homes. Twit, who worked as a LPN for 30 years at the Paynesville Area Health Care System and Koronis Manor, has been doing various crafts all her life. “I have always liked doing things with my hands,” she said. She retired three years ago and started on many craft projects. “I’m busier now than ever,” she added. Twit also volunteers her time at the Hilltop Good Samaritan Center in Watkins, doing crafts for the center. Twit and a neighbor, Elaine Siefert, have tied 16 quilts. “We do a lot of things together,” Twit added. Twit said she never throws anything away. She has turned a spare bedroom into her sewing/craft room. In one corner, she has leftovers from previous craft projects neatly stacked waiting to be used again. Twit has a sewing machine and a surger which are open all the time, ready for use. On the floor below the sewing machine is a large fish bowl full of buttons which she uses as trim. Twit added that she is constantly on the lookout for bargains when she is shopping. “You never know when it will come in handy for a craft project,” she said. She has taken small cup and saucer sets and added flowers for decoration. Another project involved painting a plate. The finished product looks like stained glass. Twit said her whole family is into crafts. Her son, Ken, enjoys cutting things out of wood; her sisters both sew; and her daughter in-law, Jean, owns a shop in Freeport where she does wedding arrangements. Another daughter-in-law, Audrey, enjoys making and giving away “Brownies in a Jar.” The jar is filled with ingredients to make brownies and all a person has to do is add the liquid. In scanning all her craft projects, Twit said her favorite projects have been the porcelain dolls. 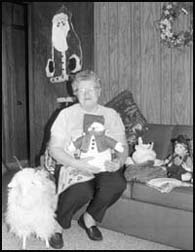 Her second favorite project she enjoyed was sewing together the Santa and snowmen. Twit also gathered together a few of her favorite recipes and compiled a small cookbook which distributed to her family. She even had to do a second printing since they were so well liked by her family and friends.